It has become rather apparent that, for a blog entitled ‘The Scifi and Fantasy Reviewer’, I, er, haven’t actually been reviewing many science-fiction or fantasy titles. 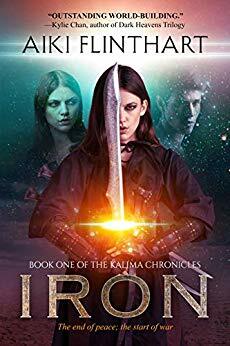 Therefore incredibly good timing that author Aiki Flinthart contacted me and offered a review copy of her latest fantasy title, Iron. The cover certainly looked impressive, of a much higher quality than you usually find in the self-publishing and indie-publishing areas of the scifi and fantasy genres, and I liked the subtle use of colours and integration of stock imagery to make an attractive and memorable cover image that rather reminded me of a film poster. I usually only mention the back cover blurb of a title in passing, but here I’ll take a few moments to examine it in detail, because to me it acts as a summary for the good – and bad – things to be found in Iron. At first glance, there are really a lot of tropey terms and generic genre language, much of which doesn’t quite make sense. So we get odd-sounding phrases like ‘The Jundom of Mamalakah’ and ‘First Jun’ and so forth which just about make sense in context – the ruling power, and the head of the ruling power – but for me, personally, didn’t really engage me. But then comes the kicker, the thing that hooked me – the idea that a hidden iron ore deposit could ferment a bloody revolution. I absolutely love this, the way Flinthart has gone back to basics for the resource being fought over. How many times have you come across genre titles that focus on really rare resources, like plutonium or titanium, or purely fictional resources – perhaps best spoofed in the film Avatar with its ‘Unobtanium’ – that are transparently based on something real? Here Flinthart has been sensible enough to avoid such a tired trope, and instead utilise a real life resource that used to be one of the most sought after in history, as something to be fought over? As far as I’m concerned that’s an original angle in the genres these days, and I was both intrigued and impressed. I had to hold onto those two thoughts, however, when I actually began reading the novel. From the first few paragraphs I could tell two key things about Iron. Firstly, that Flinthart has a knack for engaging writing, with some very good one-liners, excellent descriptions of protagonist Alere’s environment, and characters that are nicely engaging. There’s also a great vein of descriptive writing running through through the novel, and the author’s descriptions of the nicely-varied environments that appear in the novel are well-done and genuinely appealing. Unfortunately, the second thing I noticed was that all of those good qualities are noticeably drowned out by the mass of fictional, world-building terms that are thrown at the reader in very short order. Now I don’t want to be seen to be criticising unfairly, because I know that this is a common practice in the genres, to the extent that there’s a trope named after it on TV Tropes (Calling a Rabbit a Smeerp) which is itself based off of the famous writer’s guide, the Turkey City Lexicon. But it’s particularly egregious at the start of Iron, with a large number of terms thrown at the reader without any contextualisation. It’s a little wearying to be honest, especially as it can take several chapters passing before they’re explained; to take one example, we discover that the Alcazar, which appears to be crucial to both the plot and Alere’s fate, is actually the palace of the Jun First. There is, to be fair, an extensive appendix at the back with details of the meaning of each word and phrase, but flicking back and forth is awkward to say the least, and disrupts the otherwise smooth pacing of the book. However if you are able to persevere for a few chapters – Flinthart’s obvious skill as a writer helps here – and have the cover blurb open and ready to consult for some of the key terms used, then an interesting and engaging plot is finally allowed to emerge. Underneath all of the jargon is a vividly-described feudal world segregated by class, ability and access to resources, and ruled by an oppressive hierarchy that strictly controls how its subjects live and divided into a dizzying array of Houses, Clans and rigidly-enforced specialities such as Healers and Telepaths. Protagonist Alere belongs to Xintou House, which specialises in the afore-mentioned telepaths, but despite this doesn’t have telepathic abilities; she is an excellent sword-fighter, however, and someone who chafes at her sheltered existence. It’s certainly an incredibly common trope of the fantasy and Sci-Fi genres, but as I always say, that doesn’t matter if the author does it well, and Flinthart does an excellent job of making Alere interesting and sympathetic right from the start. That sheltered existence doesn’t last for long, however – after being sent to act as a mistress to Jun First, one of the most powerful positions on the planet, she becomes involved in machinations that lead to revolution. The Jun First is dying, poisoned by those who wish to uncover the secret of an iron ore deposit; the planet’s natural resources are so scarce that this deposit could refined into weapons that could set the entire planet to a disastrous conflict. Unwillingly encumbered with this knowledge, and mysterious and worrying revelations about her parentage, Alere is forced to go on the run after being framed for his murder. Unlike many of the protagonists I’ve encountered over the years in the genres, Alere is actually a genuinely interesting character, as are the situations she’s thrust into. Raised to be a telepath in a House specialising in telepaths, only to be found to be devoid of those skills, is a hell of a burden, and I well understand the weight of expectations that you can’t ever hope to fulfil. So I emphasised with her frustration and anger, particularly at the way the leader of her House expected her to act as a spy while simultaneously being a courtesan to a lecherous older man. Flinthart deftly pulls together a plot of political and cultural espionage and machinations, and all of the treachery that comes with such plotting. It’s a great plot and Flinthart moves it along at a smooth and even pace – again, not something guaranteed even in genre titles put out by the big publishing names – and I won’t spoil the latter parts of the narrative, or all of great twists that Flinthart introduces, but suffice to say I can’t wait to see more titles by the author set in this universe. There’s not only politics and cultural issues, however, there are also some really good action scenes to be found along the way, which Flinthart writes in a way that comes across as both realistic, and vividly brutal. Alere and her House Bodyguard Kett are highly skilled with their swords, and it was good to see Alere come into her own as her confidence slowly grew. You see, now, going back to what I mentioned at the start of the review, Flinthart’s decision to use iron ore, rather than something rare like, say, plutonium or titanium, or even a completely fictional element, really appealed to me. Not only is it a real-life substance, making it easier for the reader to relate to, but it also harks back to our reality’s history, where a material that is so common and unremarkable now, once used to be the focal point of violent and bloody conflicts. This also ties into a background element in Iron that intrigued me – the idea that this planet was colonised by a group of colonists from Earth centuries ago, who purposefully chose a planet which had few natural resources. Therefore something as common as iron ore would be of supreme interest. This focus on the rarity and scarcity of metals used across the planet, and the availability of resources more generally, is another aspect of the novel that I found refreshing, especially as Flinthart deftly uses it to highlight the inequalities and levels of oppression in the society she has created, and which has existed for nearly a millennia since the first colonists arrived from Earth. There’s a fully-fledged world to be found in Iron, and once you’ve got all of the new terms right in your head, it’s a fascinating and detailed world; Flinthart has obviously invested a lot of care and attention to creating it and that really comes through, even down to social and cultural terms utilised by its inhabitants. To take just one example, the concept of Father-Kin and Mother-Kin names, and the respect or social stigma attached to them, was something I thought was particularly inventive, particularly as it simultaneously ties into the heavily status-based society of the world found in Iron, and also has reflections on our own society. Like the Horror genre, Science-Fiction and Fantasy are often at their best as forms of social commentary, and Flinthart smartly follows in that great tradition. Indeed, I was pleasantly surprised by how deep and complex this social commentary actually goes – while I’ve come across fantasy and sci-fi titles before that have this goal in mind, it’s incredibly well-executed by Flinthart; by the end of the novel I was having distinctly deep and detailed thoughts about issues she had raised along the way about xenophobia, persecution of minorities and the ethics of deliberately colonising a planet in a manner that will force those living there, generation after generation, to live in a deliberately stunted manner, economically, socially and culturally. That inventiveness and imagination run into the characters found in Iron as well. Alere is a wonderful protagonist, smart, strong, skilled and independent, and her relationships with various other people she encounters and travels with really do form the core of the story in Iron. I enjoyed how her relationship with Kett slowly evolved over the course of the novel; and also her links with Rohne and his complex back story which filled him with anger and bitterness, all of which were justified given how badly a conservative society had treated him. Even minor characters are well fleshed-out and not just treated as cardboard cut-outs, and that attention to detail really brings the novel to life. Although never a main character, I was intrigued by Mistress Li of Xintou House – not only is she a powerful telepath, but she weaves complex and multi-layered plots around Alere and her companions, and holds the fate of the entire planet in her hands. It was the same for the Jun, the rulers of the various principalities that are visited in the course of the plot; the idea of various levels of seniority within the Jun was interesting, and played out well within the narrative, especially as Flinthart deftly plays up the politicking and intriguing between them, and some of the more unstable personalities. In conclusion, after a slightly rough start due to an overuse of unfamiliar terms for people, areas and cultural issues, Iron quickly evens out and begins to demonstrate Flinthart’s undoubted skills as a writer. The plot is detailed, complex and moves quickly without any wasted time or pointless subplots; and while the politics and cultural complexities involved in advancing the narrative become quite detailed at times, the author handles them all with a confidence and deftness that means they never become confusing or overwhelming for the reader. Quite the opposite, actually, as they’re some of the best elements in the entire novel, and if anything even more engaging than the plot itself. There’s a fantastically detailed and richly imagined world to be found in Iron, and I’m genuinely amazed at the amount of thought Flinthart has put into it, resulting in consistently high-quality world building that truly brings the novel to life, and surpasses that many other authors that I’ve read over the years. Add to all of that excellent writing and some great action scenes, and you have a superb piece of science-fiction and fantasy fiction by an immensely talented author.